Mounted Tablets and Ipads are being increasingly used in the retail store environment. They can become register stands, provide product details, and serve as point-of-purchase displays. Although Tablets and Ipads are readily available, secure holders for them are harder to find. At Assigns, we provide a variety of solid, standardized stands specially designed for retail stores, and if you require something more original, our experts will customise a current product to your requirements. A mounted, easily-accessible tablet in a retail store can help customers participate in the brands online activities and promotions. With a mounted tablet, Ipad, customers can enter their name and contact info without having to leave the store or fill in a paper form, that needs to be uploaded separately by data handlers. The in-store tablet can also provide data about store merchandise and useful brand information. Register stands: On a tablet or Ipad, purchase information is collected in one place, easily accessed by both employees and customers, allowing data to be uploaded to main systems for processing, thank you for your purchase emails and future email marketing and brand engagement and retention. Customer information center: Load customer-friendly apps and software that tailor to retail store needs. In addition, a computer is always in the right spot at the right time and always has the right data. Human staff may be absent or not have answers just when a customer needs help. In many ways, tablets and Ipads act as an ideal information booth. 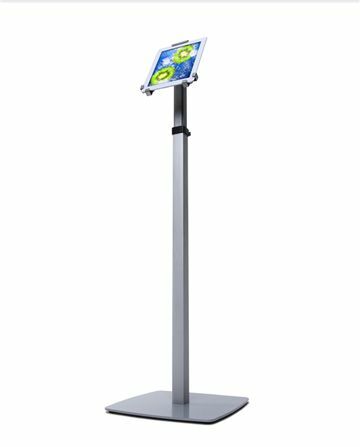 Eye-level point-of-sale display: By presenting product information, promotional initiatives, and other marketing messages, the tablet or Ipad can attract customers’ interest, promote foot traffic, and lead to new sales. In fact, stores that interact with consumers tend to draw more people than those that do not, so a mounted tablet or Ipad may improve customer retention and loyalty. Assigns tri-grip holders can be attach to walls or counters or be floor standing. Some designs allow for locks, preventing the tablet from being moved, and all Assigns holders permit 360 degrees rotation. Coming in both white and black, these mounts come in two sizes, to accommodate 10 inch screens and 7.9 inch screens. Need something more Bespoke? Assigns can help you develop new holders to suit your unique requirements, or if you provide a design, we can manufacture the holder you need. At Assigns, we work to provide you with what you require, rather than what’s already available. Assigns strives to offer better quality service and products. Our designers know the retail, sales market and mean to suit your need perfectly an afforable cost. For orders placed before noon, we promise to deliver the products by the next day, if your store is within the United Kingdom. We guarantee you friendly, efficient service; good, state-of-the-art technology; and a reasonable price. Our universal Counter Mounted tablet holder has a unique locking mechanism and a fully adjustable viewing angle with 360° screen rotation. Tablets can be inserted vertically or horizontally into the mechanism. 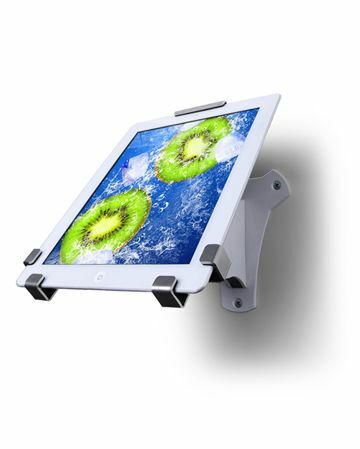 Our Floorstanding tablet holder uses the same unique locking mechanism and a fully adjustable viewing angle as the Counter and Wall Mounted versions. It also has a hole in the upright for attaching a Kensington Lock for security. 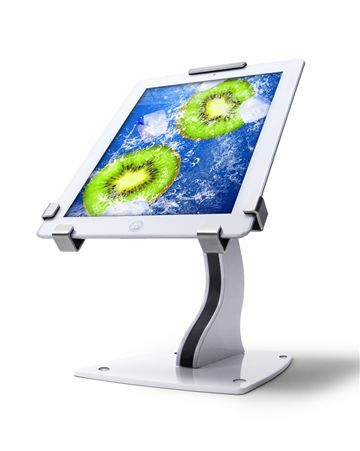 One of the newest products in our digital screens category is the super-sleek Tri-Grip Tablet Holder. Thanks to a unique locking mechanism and fully-adjustable viewing angle, this is the perfect way to display a universal tablet device. Tablets can be inserted either vertically or horizontally and secured in place using the robust clamps. With a steel base and powder-coated finish, this stand is available in either black or white and comes complete with holes already drilled in the base plate to allow mounting to either a counter or wall. There are two sizes available from stock, suitable for tablets with 10′ and 7.9′ screens. The only thing we don’t supply you with is the tablet! You can find out more about this product on our Tri-Grip Tablet Holder page.